Snake Plissken and Jack Burton together for the first time? You better believe it's happening! There are few men in the history of action movies that have accomplished as much as Kurt Russell has. Most action stars are lucky to be associated with one iconic character, but Russell has been lucky enough to be associated with several. Now, thanks to a brand new comic from BOOM! Studios, two of Russell's most iconic characters are going to meet one another face to face. The comic book publisher recently announced a new, six-issue crossover comic via Entertaniment Weekly between Big Trouble in Little China and Escape From New York. Russell played Jack Burton in 1986's Big Trouble In Little China and Snake Plissken in Escape From New York in 1981. Both John Carpenter movies have gone on to become cult classics, and the characters themselves as portrayed by Russell are some of the most memorable in the filmmaker's long history. Here is how EW described the crossover. 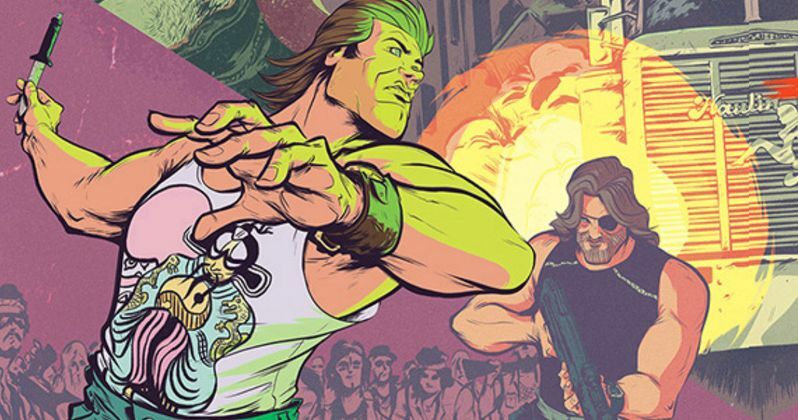 "Written by Greg Pak and illustrated by Daniel Bayliss, the title finds big-mouthed truck driver Jack Burton transported to the dystopian future of 1997, where he meets his taciturn, eyepatch-sporting doppelgänger Snake Plissken." The premise sounds delightfully campy, and seems very fitting of the tone tha that was established by both movies in the 80s. BOOM! Has been publishing comics based on both Big Trouble In Little China as well as Escape From New York for a while now, so the crossover makes a lot of sense. It is completely unclear if Jack Burton and Snake Plissken will be at odds with one another in the crossover, if they will be working together, or perhaps some combination of the two. The book is going to run for six issues, so they will have some time to do a little of both should that be what Greg Pak's story calls for. What is perhaps most exciting about the crossover is that John Carpenter, who created the characters and directed both movies, has given his blessing for the project. The six-issue miniseries is set to make its debut in stores this October, to help celebrate the 30th anniversary of Big Trouble In Little China. BOOM! is also publishing two more books about the cult classic, starting with The Official Making of Big Trouble In Little China this August, followed by The Art of Big Trouble In Little China This November. To give fans a bit of a preview about what to expect from the comic, BOOM! also released two version of the cover art for the first issue to go along with the announcement. Both covers feature Burton and Plissken prominently, and have a very campy, 80s feel to them, which makes the project all that much more tantalizing for fans. The Big Trouble In Little China and Escape From New York crossover comic is due out this October. Be sure to check out the cover art for the book below.